Obvious defects of the above period will be repaired free of charge. Warranty does not include periodic inspections and cleaning and maintenance. The User is responsible for proper care and maintenance of products, any issues arising from improper care and/or lack of maintenance will not fall under warranty and will not be entitled to free repairs or refunds. 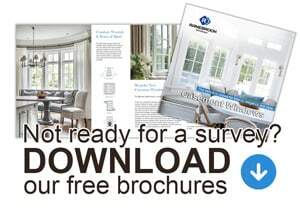 To find out more about Maintenance and aftercare, please download our free brochure here. 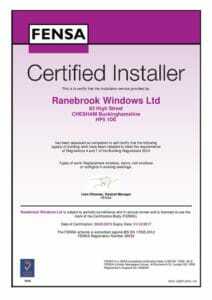 We are a registered FENSA* company and authorised to fit compliant windows and doors on your property. That means that all new windows and doors have come under the standard of building regulations. GGFi** ensures all our installations. Compliance with the Building Regulations without the added cost and time of arranging assessment by Building Control. If you own properties across different local authorities – for consistency of quality and price, you are able to use the same FENSA installer for all installations, as they can work in all Local Authority jurisdictions. * FENSA (Fenestration Self-Assessment Scheme) are a specialist organisation set up by the Glass and Glazing Federation (GGF) and other industry bodies with Government approval to ensure that compliant windows and doors are being installed in properties in England and Wales to comply with the Building Regulations Part L set out by the Government in April 2002. ** GGFi is a leading provider of Insurance Backed Guarantees on behalf of the home improvements industry. Formed in 2005, GGFi is a subsidiary of the Glass & Glazing Federation (GGF) and is recommended by FENSA, The Guild Of Master Craftsmen and other leading industry names to provide the most admin-efficient, market-relevant and fairly priced Insurance solutions possible.